Thick & Creamy, Loaded with Clams, How Do You Like Your Chowder? On Cape Cod, technically there is only one kind of clam chowder (New England style, not that tomato soup with clam bits! ), but go out to different restaurants and you will quickly learn that there is variety within New England clam chowder. 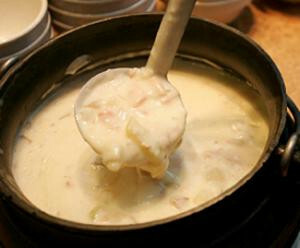 Some restaurants tend to make their chowder very thick and creamy (some even use items such as flour to thicken their chowder). Others put out a chowder that is a bit less creamy (something some people find easier to manage). Another difference is the clam ratio in the chowder. Some places load their chowder up with clams, while others portion them out a bit better with the other ingredients. Of course, that is another bone of contention. What ingredients do you add? Aside from cream, clams, and potatoes, there isn't really much of a set ingredient list to making New England clam chowder. Some places will just add salt and pepper and call it done, while others will get a bit more creative, adding items such as celery for a bit of an extra crunch. The amount of variation in chowder on Cape Cod is quite high, so next time you see "Clam Chowder" on a menu, give it a go! If you eat out enough throughout the summer, you will find which kind of chowder suits you best. Some like it a little milkier, some a little creamier, how do you like your clam chowder?